While we already knew that Super Smash Bros was getting DLC in the form of Mewtwo for the people who bought both versions of the game, but there hadn’t been any news about whether Nintendo would sell the character separately for people unwilling or unable to buy two copies of essentially the same game. Well, today’s Nintendo Direct has finally given us the answer: Mewtwo will be available for purchase on April 28, for either $3.99 for one version or $4.99 for both versions. For those that purchased bother versions, Mewtwo will be available to download on April 15. That’s not the only DLC character in development, though: Lucas was also announced and will be released sometime in June. Lucas was added due to fan requests, and Nintendo has decided to open up a Fighter’s Ballot, so that rather than Sakuri and his team having to scour forum threads and comment sections, players can directly petition for characters. This is not a guarantee of a DLC character, but it does give fans a way to direct ask the development team for their favorite characters. Last, but certainly not least, Nintendo has announced that new outfits for Mii Fighters will be available for purchase as DLC. 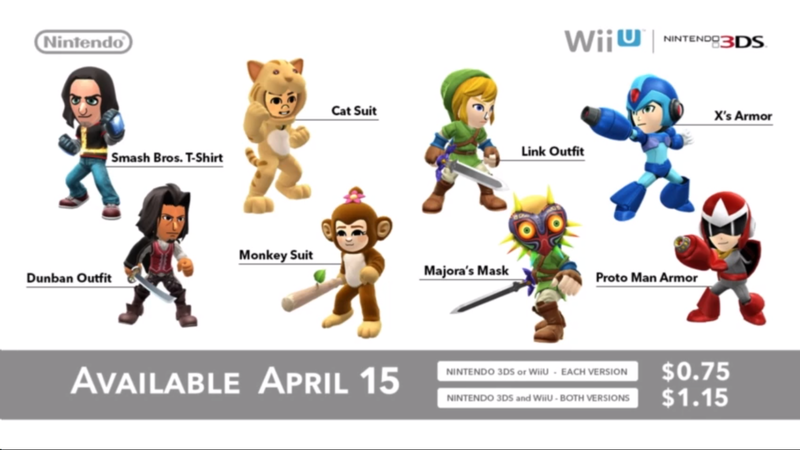 Some of the ones they’ve shown include a Dunban outfit (Xenoblade Chronicles), a Proto Man outfit (Mega Man), a cat outfit, and a monkey outfit. They will be offered on April 15 for $0.75 (one version) or $1.75 (both versions), though it isn’t clear whether that’s the price for the whole pack or simply one outfit. Anyhow, a lot of surprises for Super Smash Brothers fans here. Anyone planning on picking these up?